When and where for a stamp showing a woman doing an ordinary job as on the stamp above? In the United Kingdom, a woman who wasn't the Queen did not appear until 1968 when the suffragette Emmeline Pankhurst appeared on a stamp. In contrast, Turkey had put suffragettes on stamps as far back as 1934, the year in which all Turkish women got the vote. 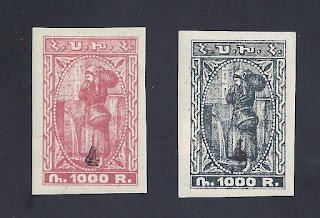 The Soviet Union depicted a female worker and peasant in two of the designs for the 1929 definitive series - earlier definitives showed only male workers, soldiers and sailors (Correct?). The stamps are all from the 1921 Second Yessayan series printed by the Armenian firm of Yessayan (or Essayan) in what was still Constantinople. The stamps were ordered by the new Armenian Soviet government and the designer was Sarkis Khachaturian. Yessayan had fairly recently printed the Wrangel Refugee overprints and the Levant ship fantasies which did not stop him getting the Soviet order. 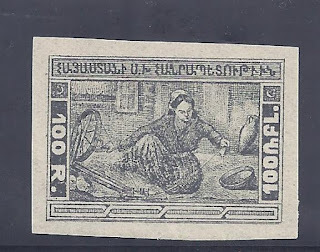 Part of the original printing of the Second Yessayan stamps was on a porous, yellowish paper rather than the usual white and non-porous paper. The 100r above is on the yellowish paper but both of the 1000r are on the normal white paper. The stamps on the yellowish paper are normally in an ink which is nearly black rather than grey and they are sometimes mistaken for proofs. All the reprints of the slate colour of this stamp are a paler grey and the red stamps a paler red, and only the forgery uses a yellowish paper - but then the paper is not porous and the yellow gum is laid on thick. 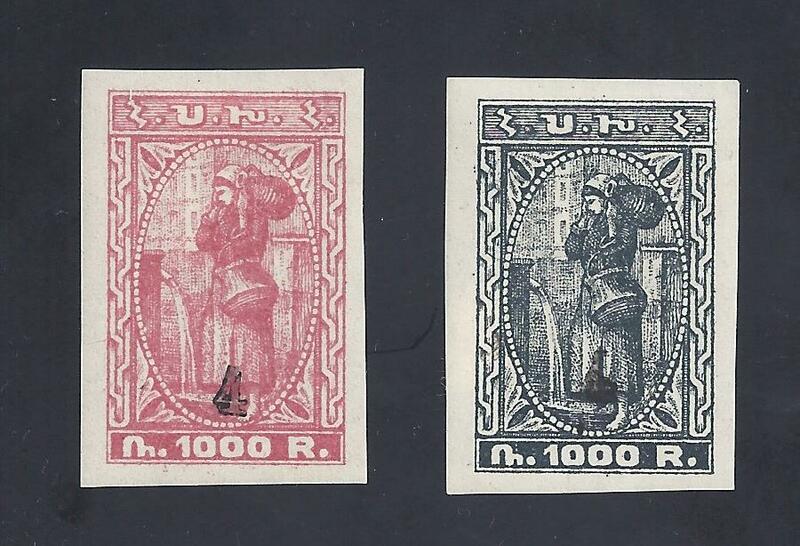 The unissued 100r stamp above is really quite scarce but the issued stamps with surcharges are not so hard to find. It would be interesting to know the source of Khachaturian's designs - he also has a shepherd boy, for example, and a train leaving Yerevan station (popular with Thematic collectors). Did he have photographs of the woman spinning and the woman carrying water? Or did he make a sketch? Note that the woman fetching water appears to be barefoot.